BAA has agreed to sell Gatwick, the UK's second busiest airport, to Global Infrastructure Partners (GIP) for a fee of £1.51bn. BAA said the proceeds of the sale would be used mainly to repay part of its debt, which stood at £9.6bn in June. Investment fund GIP already owns a 75% stake in London City Airport. BAA was ordered to sell Gatwick after an inquiry found that customers were suffering from a lack of competition between airports. It has also been ordered to sell Stansted and one of Glasgow or Edinburgh, but is appealing against the decision. "BAA is changing and today's announcement marks a new beginning for both Gatwick and BAA," said Colin Matthews, BAA chief executive. "We wish Gatwick well for the future and are confident that the airport will flourish under new ownership." He added that BAA would now focus on improving Heathrow and its other airports. Michael McGhee, the GIP partner leading the acquisition, said the new owners would "upgrade and modernise Gatwick Airport to transform the experience for both business and leisure passengers". The sale of Gatwick, which is subject to approval by the European Union, is due to be completed in December, BAA said. Shadow transport secretary Theresa Villiers said: "We have long been calling for the break up of BAA's monopoly over so much airport capacity in the south east, so we welcome progress in taking that forward. "However, it is vital that the new owners strive to improve the service customers receive and also work with local communities to minimise the airport's environmental impact." Commentators said the deal could lead to better services at the airport. "It should bring huge improvements for passengers, at least this is what the airlines have been arguing," Simon Calder, travel editor of the Independent, told the BBC. "There is ferocious competition between airlines, but very little between airports," he added. "At the moment, there is very little incentive to get passengers to switch between Heathrow and Gatwick. [Following the sale], we will ultimately have proper competition between airports." Mr Calder also said that GIP could look at increasing capacity at Gatwick. "It is now possible that the new owners will invest in a runway that can legally open at any time from 2019 if the planning process goes through." Gatwick has two runways, but they cannot be used at the same time, Mr Calder said. This week, BAA began an appeal against the order to sell three of the seven UK airports it runs within two years. It also owns Aberdeen and Southampton airports. The airport operator believes the Competition Commission ruling was compromised because of a link between a member of the ruling panel and an organisation interested in buying the airports. BAA also argues that the commission did not properly take into account the impact that the recession would have on the airports' sales. At the start of this year, BAA said its annual profits had fallen by 18.4% after the economic downturn dented passenger numbers. 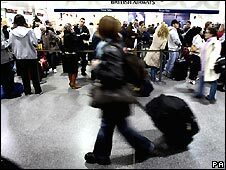 It reported a profit of £582m before tax and interest, down from £713m in 2007, as the number of travellers going through its UK airports fell by 2.7%. BAA was bought by Spain's Ferrovial for more than £10bn in 2006.